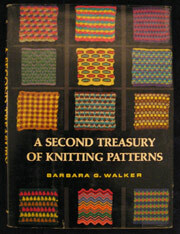 Barbara Walker’s Treasuries are considered the best stitch dictionaries around, and I agree. The hardcover editions are out-of-print, and have to be hunted down as used copies on Amazon or eBay. I got this one on Amazon, and it’s in excellent condition. The dust jacket is a bit worn, and the pages yellowed, but it looks untouched otherwise. It was a great bargain at less than $30 including S&H, and now joins the first Treasury (in similar condition, also from Amazon, also slightly less than $30) on my bookshelf. I have not knit a row since Sunday. Grandma’s socks are starting to drag and I want to finish them quickly. Sigh.